(天雨国际公司) RAIN SOUL(元气) -PURE WELLNESS: HELLO UNCLE and AUNTIE ! DON’T BUY RAIN SOUL FROM DUBIOUS SOURCES !! HELLO UNCLE and AUNTIE ! 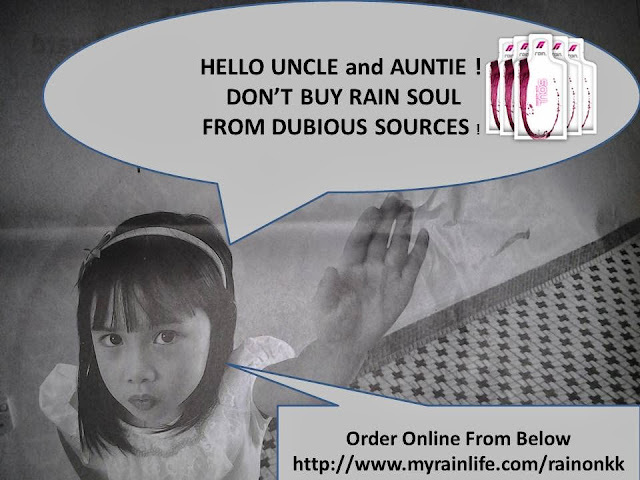 DON’T BUY RAIN SOUL FROM DUBIOUS SOURCES !! Don’t risk your life and money with Cheap Below Cost RAIN SOUL Product found at "LE-LONG FLEA MARKET". Always buy direct Online with Our Rain International Distributors. These unknown Sellers operate from makeshift stalls, online shops and even public places such as void decks, markets and coffee shops. Such cheap below cost Rain SOUL are also sold by word of mouth through friend or acquaintances as the more boxes they buy the cheaper the price. But tragically, these boxes of Rain Soul may be in Old Packaging, Expiring soon date, repacked into 10-20 sachets per box (original Rain Soul is 28 sachets per box). And the worst is the boxes were stored in the Boot of the Van under the Hot Sunny SUN for long period of time. All Nutrition ingredients contain in the Rain SOUL pack is heated up and loosing its effects and could cause severe reactions to our body or even no reaction at all. Consuming Cheap Below Cost Rain SOUL from dubious sources is a waste of your Money and Not Save your Money. Think Twice before you buy from them. Always Join or Order online Direct From Our Qualified Rain International Distributors. Because buying from us, the boxes are freshly packed and placed in a cooling environment in our Rain International HQ Logistic Store. And is waiting to deliver right to your doorstep in every part of the World. 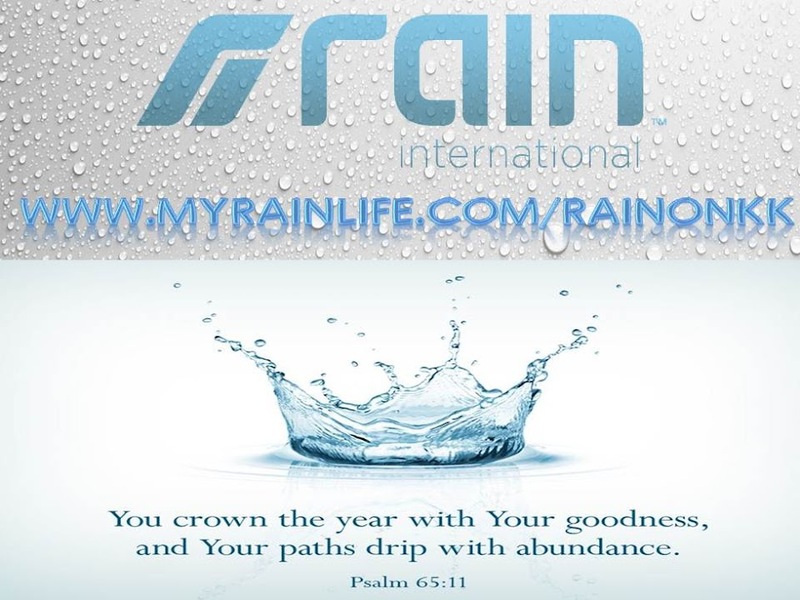 To learn more about the product / where to buy/ how to be a Rain Global Distributor . Feel Free to contact Our Rain Elite Distributors below. 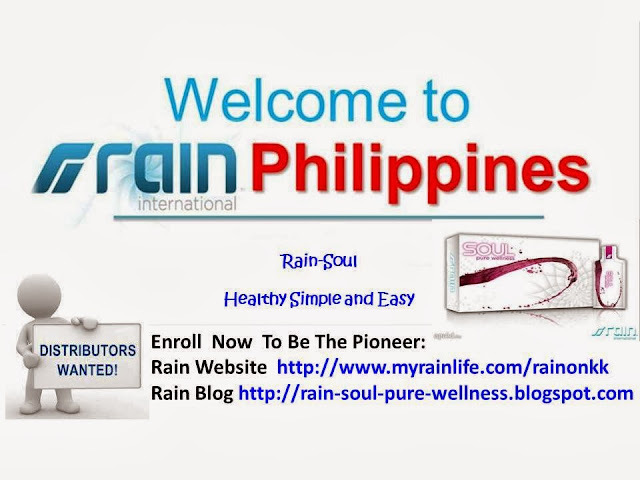 For Rain Philippine and Thailand Opportunity : Open Beginning of 2014.